An "open style" collection that captures some of my creative impulses. It ranges from classic to avant garde to vintage industrial. Designs will always be changing as I go along in my artistic journey. Some of the pieces in this collection will become basis for individual collections. When I started my exploration in the arts and especially light and the way it travels into diverse materials, I always wanted to experiment with Lucite and colors. 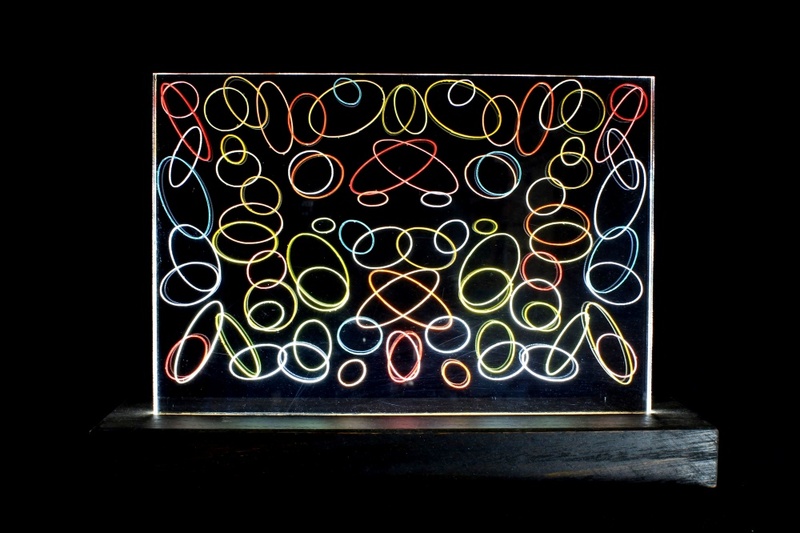 "Bubbles" is an example of that work. The Lucite is etched on both sides, in this case with elliptical shapes, and then painstakingly colored. The effect is true amazing, during low light time, the colored shapes come to live with their randomness and detach from the darkness. It is for people that do appreciate modern designs and unique concepts. The work comes with a wall power supply and cord. This unique sculpture was a true challenge to design. I took about three months to find a way to fabricate it then another 3 weeks to put it together. The end result does make an impression in a darker space and is a curiosity in its shape. The pyramidal base is walnut. Dimensions: 20" height, 14" diameter torus. 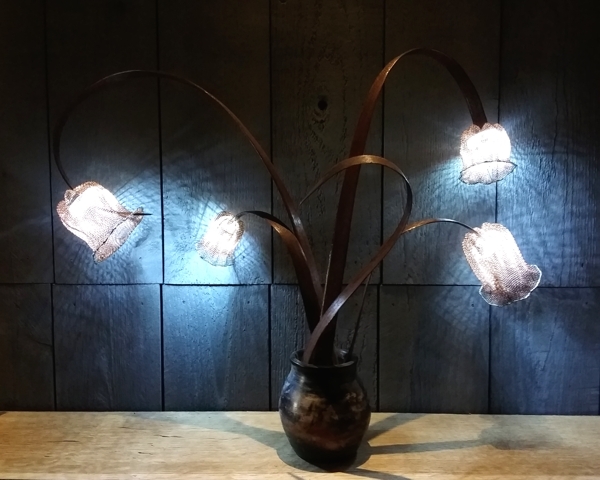 The base of this lighted sculpture is a hand made ceramic clay vase from which stems stretch out tipped by a delicate light, evoking a modernist interpretation of flowers. 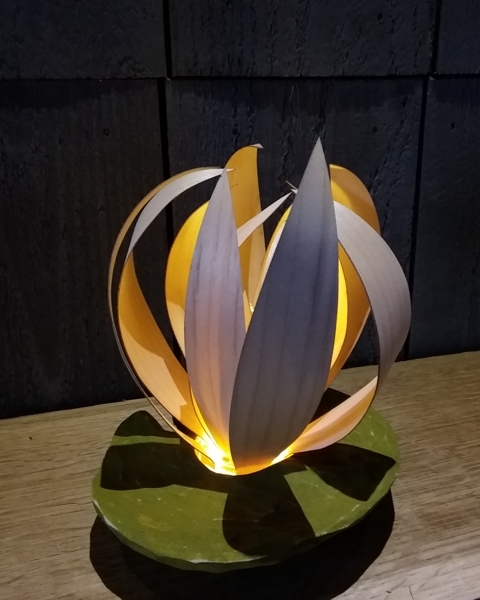 The low power LED source casts a rich yellow orange glow from each bloom. 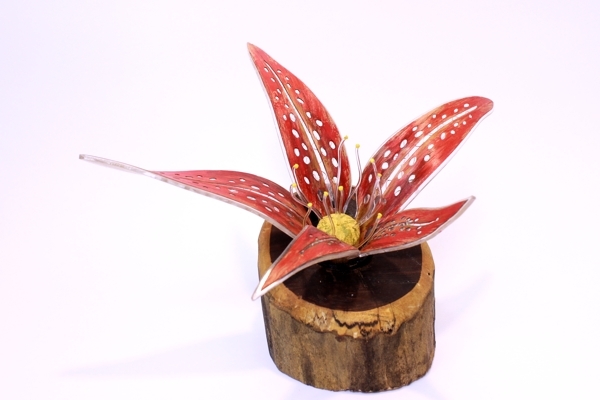 Dimensions: 20" (tallest stem) x 21" (diameter of cluster), vase is 5" tall x 4.5" diameter. Copper mesh is an amazing material to work by hand and great to make a lacey warm colored shade. 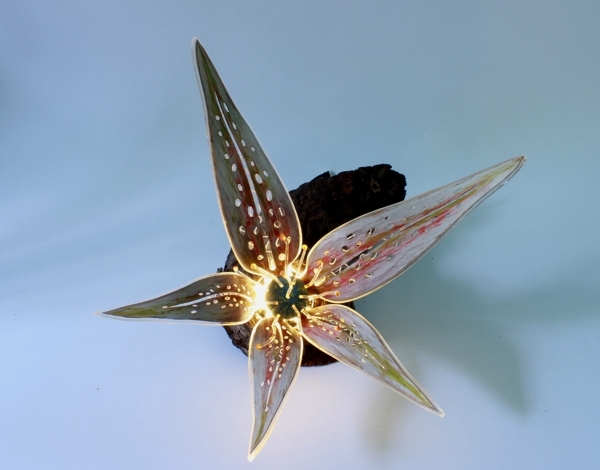 This larger lighted sculpture capture my passion for mixed materials. 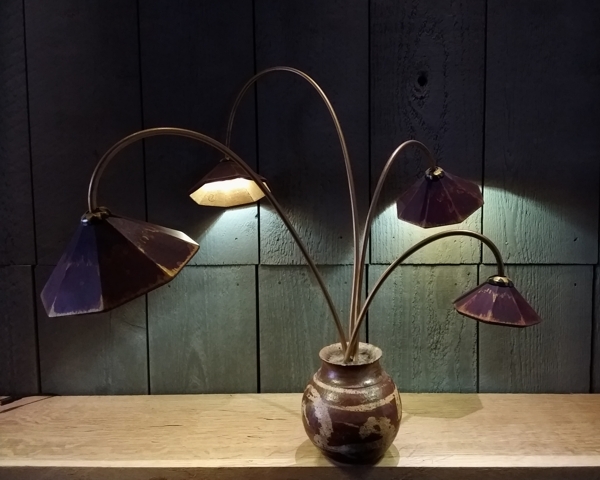 Ceramic base, copper blossom and oak stems....Heaven ! Dimensions: 25" x 24" overall, 6" diameter base. With no beginning and no end, this work connects us to infinity in several ways. It is a sculpture that can be shaped to just about any random form allowing true interaction with the viewer. 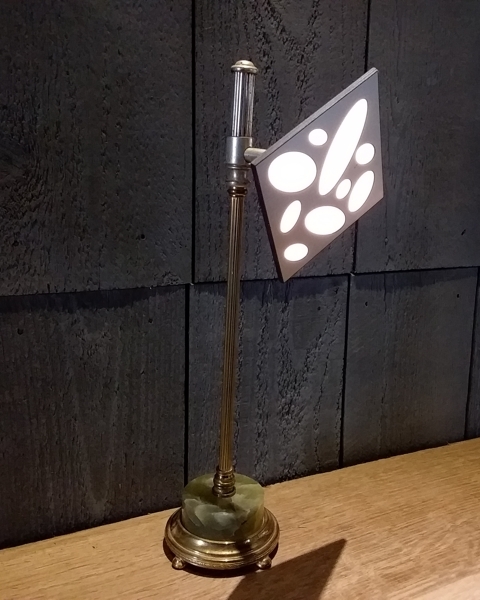 The white light makes this piece litterally glow in a the dark due to its high contrast ratio. 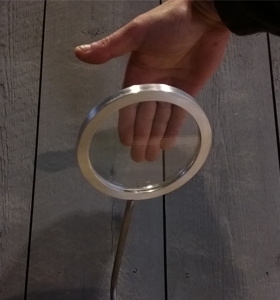 Dimensions: Can make a 24" diameter circle. Art and technology are not antigonist any more. I mainly choose to use it (technology) in a subtle way making it a "background" but they are times when new materials are so exciting that they do need to be showcased. Geometrika is a magnificent example of it. The minimalist approach and technical integration illustrate some of the challenges of staying relevant in an always changing and more complex world. The piece displays its materials in an unapologedic way to show that less processing and glitter help us reconnect with simplicity. Dimensions: 14" tall, 4.5" diameter orb. There was an amazing scene in the movie "The Avatar" that did make a great impression in my mind. It was that mythical forest where every plant was luminescent, it was just beautiful. Years after, I still had those incredible pictures in my mind and wanted to materialize them into a sculpture. This work has been a great success here at the studio. Dimensions: 10" x 8" overall. Same as above piece except mounted on a small stump. 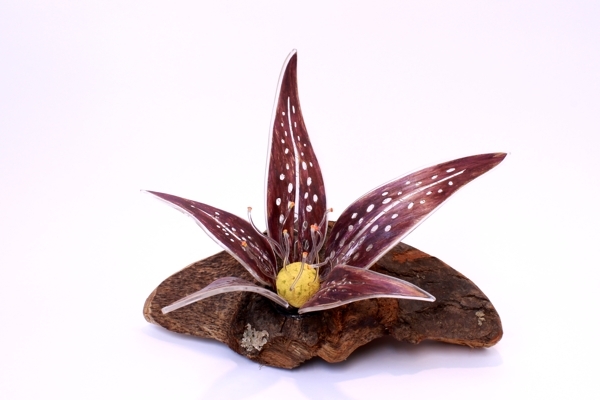 Same as above piece except mounted on a small wood piece with bark. Same as above piece also mounted onto a small wood piece with bark. Delicate petals made of thin maple wood finished in a washed red color set into a hand carved pad shaped base convey simple elegance. 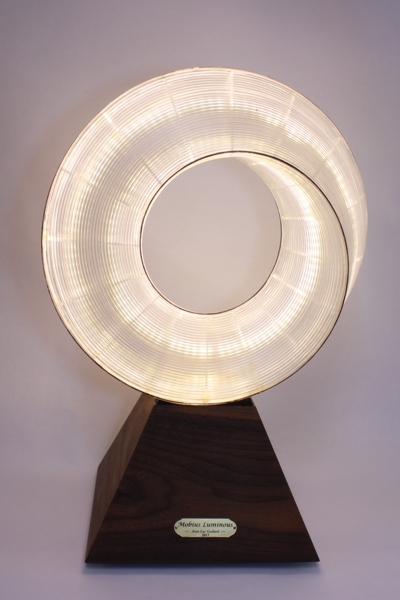 A soft light source accentuates this meditative sculpture. Delicate petals made of thin maple wood in natural finish with a hand carved pad shaped base convey simple elegance. 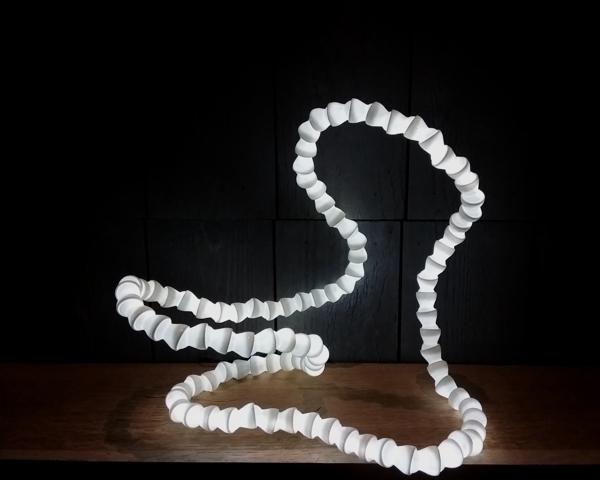 A soft light source accentuates this meditative sculpture. In my view, art needs to promote conversation and wonder. This piece a great example of this. 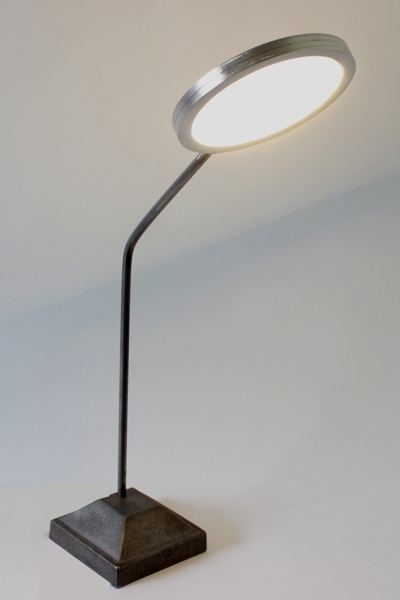 When looking at it, one can see light shining under the shade but can't see where it is coming from... An early gold-finished cast iron base is capped with a unique pierced signature shade. 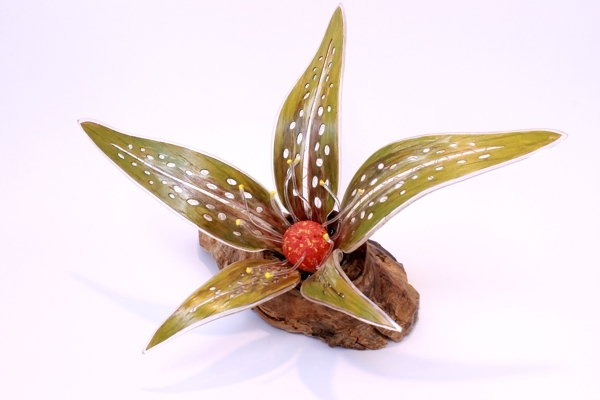 The base has a refreshing flower design showing a fan of petals on its lower part. 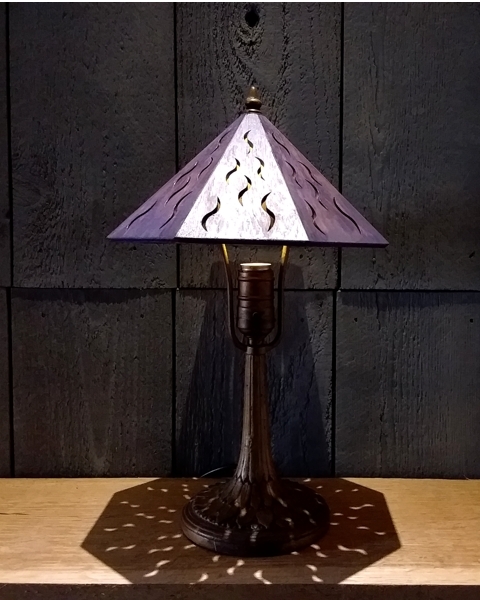 Dimensions: 14" tall, 8.5" diameter shade. 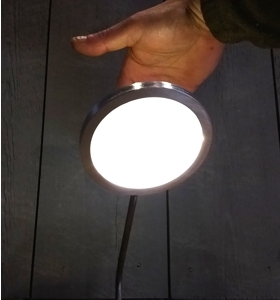 Just like "Lumen reverance", this piece is a show case of technical breakthrough in LED lighting. Not available in this country yet, its light source is 0.030" thick and has a visible spectrum that renders colors very accurately. Myst is a denty sculpture that has not only steampunk inspirations but also rooted in a very well known defunct video game with the same name. Nothing is more satisfying than gathering miscellaneous brass parts and pieces and composing a new object out of them. 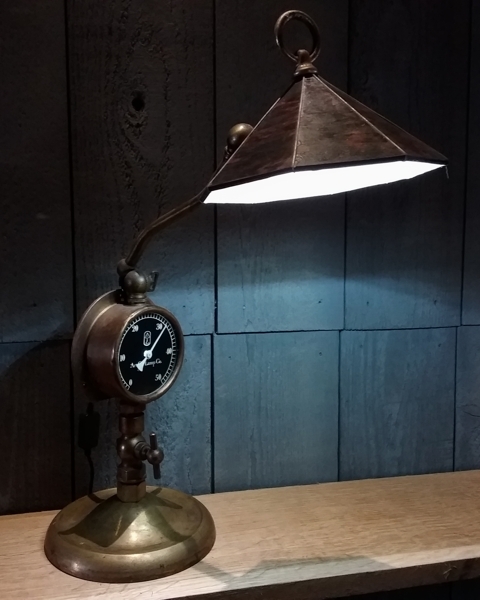 Include an antique steam gauge with modifyied backlighted dial and you get a cool steampunk piece that gives off enough light to be a reading lamp. 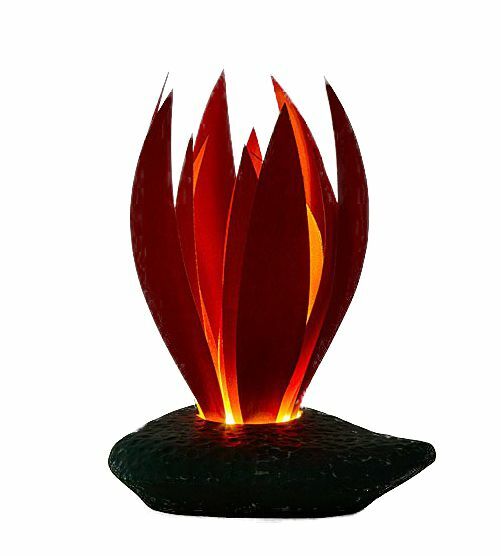 Dimensions: 20" x 14" overall, 7" diameter shade.